With goals from Messi and Neymar, Barcelona had the La Liga encounter with 5th placed Sevilla on Saturday almost wrapped up. But goals from Ever Banega and Kevin Gameiro stunned the Catalan giants and helped Sevilla to maintain an unbeaten run of 32 games at home at Estadio Ramon Sanchez Pizjuan. It will be here that Zenit Saint Petersburg FC will face the prevailing Europa Cup holders on April 16th evening for their 1st leg of the quarter-final clash. Andre Villas-Boas's has been able to mould Zenit into a tight defensive unit that makes it hard for rivals to score against them. The Russian club have conceded just one goal from the 4 games they have played in the Europa League so far, while scoring on 6 occasions. The defense has especially been bolstered by the introduction of Javi Garcia and Ezequiel Garay but will really have to watch out for some deadly counter-attacking from the likes of Kevin Gameiro, Carlos Bacca and Vitolo. Villas-Boas's 5-3-2 may not hold him in good stead at Sevilla. They will need goals there, plain and simple. Despite the 1-1 draw against Rubin Kazan on Sunday, Zenit are at the top of the Russian League with 55 points and a comfortable 8-point lead over nearest rivals FC Krasnodar. Andre Villas-Boas is the first manager in the Russian league to have won the first six matches he managed since he took over the reins of Zenit in September 2014. But what could be most damaging for his team is the suspension of four of his key players post the Round of 16 clash against Torino which saw them accumulate as many as seven yellow cards during the course of the match. The absence of two attacking options in the form of Hulk and Danny upfront and backs Igor Smolnikov and Domenico Criscito will be seriously felt and will be a huge handicap going into Thursday's encounter. Strangely Villas Boas remarked in a recent interview that he considered his Russian League clash with Rubin Kazan more significant than the Europa tie with Sevilla which lends credence to Zenit's suicidal rush for yellow cards against Torino. For Sevilla coach Unai Emery, Vicente Iborra's pivotal role in the central midfield will hold the key to the match outcome. The Spaniard's stamina, aerial prowess and late runs is what will provide his team's goals. Emery is like to stick to his 4-2-3-1 formation which lends considerable depth in defense and leeway for attacks. Forwards Bacca and Gameiro with 20 and 14 goals respectively this season will be hungry for scoring opportunities. 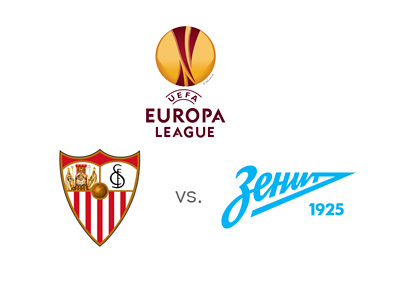 In the Europa group encounters, Sevilla were impressive with some dour defending, superb goalkeeping and opportunistic finishing and are likely to continue in the same vein going into the first leg clash with Zenit. The absence of the creative Hulk upfront will mean that Zenit will have to depend on the services of someone like the 26-year Belgian Axel Witsel who has just scored twice this season but his passing skills along with defensive qualities could make up for the loss of the mercurial Brazilian forward upto an extent. Zenit are past the Round of 16 stage of the Europa Cup for the first time since they won the title in 2008. Sevilla have won the tournament each time they have reached the quarter-finals in the years 2005-06, 2006-07 and 2013-14. With the suspension of so many key players, Zenit may have blown whatever little chance they had in going past this stage of the tournament. A goalless draw at the Estadio Ramon Sanchez Pizjuan would be a great result for them and a boon going into the return match at St. Petersburg on April 24. Bookmakers are giving the Russian outfit very little chance in the 1st leg clash on Thursday night.